This is an exclusive interview by exclamation with David Jakubovic, one of the editors of Kamen Rider Dragon Knight. Perhaps you should start by explaining exactly what your job was as series editor? The editor's job is to receive all of the footage filmed, and put it together into a cohesive, entertaining episode. In the process, you select the best takes, the performances you like best, and as you splice it all together you create a rhythm, hopefully a dynamic and exciting one. How did Kamen Rider Dragon Knight differ from other shows you’ve worked on? KRDK was unique to me because of two things, and both of these are related to the action scenes. The first, is simply the amount of them. We shot 40 episodes. I think I edited something like 25 of them. That's a lot of episodes to begin with - but in every episode, there was a LOT of action, lots of fighting. Fight scenes have always been a fun bonus to me. You edit a film and there's lots of stuff in it, a lot of dialogue, action, this and that, and sometimes there's a fight scene - and those have always been tremendous fun for me to cut, because they're exciting rhythmically and they are musical, in a way. They're just good fun to edit. But on Kamen Rider, there were just so many. The fight scenes just kept coming in! And it was interesting because they became almost second nature after a while, no thinking necessary. The other thing is the use of Japanese footage. This was a very interesting, and strange, challenge. It's strange to use an already edited sequence inside an episode you're creating. Because the editing style of many of them might differ from how I am approaching the following fight scene, yet I cannot change what has already been done. So I would try to make adjustments if I could, so that it feels as seamless as it can, but it wasn't always simple. Is working with existing footage a challenge you’d enjoy taking on again? I am interested in interesting projects. If the project is good and intriguing, then anything is possible. How much did you know about Kamen Rider before starting on the show? Actually I never heard about KR before working on it! I had no idea how huge it was in Japan, and how it had a strong core of fans elsewhere. Every Japanese person I know is very much aware of the show. That was fun to discover. What was the most enjoyable part of working on Kamen Rider Dragon Knight? What makes any project enjoyable is the combination of how interesting, creatively, the work is, and the people you work with. The project itself was loads of fun, especially the action. I love cutting high-energy action, and the fights in Kamen Rider are indeed energetic. It was also nice seeing the special effects come to life. When cutting a film, you tend to be very involved in the special effects process as you see a film through all stages of post production. On this show, however, there was little time for that, since there was a massive workload and I had to just keep editing episodes. Steve Wang, who is himself a very experienced editor, and special-effects master, supervised all the effects. Which made for exciting surprises for me every couple of weeks when I would sit down and watch one of my episodes, suddenly with all the freshly made special effects. In addition, the people on this show have been great to work with. Steve and Mike Wang are delightful to work with, and we had an excellent post-production crew. What was your favourite episode of Kamen Rider Dragon Knight? Was it one you edited? My favorite episodes are any episodes in which Xaviax has a lot of scenes. I find him tremendously entertaining. I really like the episodes with the character Chris Ramirez, the Marine, perhaps because I had asthma as a kid and had some degree of sympathy with him, but I found the actor's portrayal of this character to be warm, sensitive and strong. I also really enjoyed the relationship between Xaviax and Drew Lansing and found it to be very funny at times. A specific favorite episode may have been one of the earlier ones, and if I recall correctly it was number 6, "Kamen Rider Torque," because it had some extra-well-done fight scenes that I remember enjoying very much to edit, same goes for episode 18 in which there's a great fight sequence between the two brothers, and Len, with no Kamen-Rider costumes. Whenever you edit something, no matter how meticulous you are and how much you liked an edit when it was done, you will always look back at it a while later and see the occasional moment to which you say, "ah, I should have done that differently." I'm pretty sure I watched this on TV and said this to myself every once in a while. It's normal. I can't think of a specific instance now, but certainly this happens. But as it goes with this show, it's only small details which no-one else would care about except for an over-obsessive editor. Just last week I finished editing a series of live-concerts called "Live From the Artists Den" which was a wonderful experience. I got to edit concerts for Tori Amos, David Gray, and Ringo Starr. Awesome fun. Right now I'm working on a couple of commercials, starting some pilot next week, that sort of thing. And in the meantime I keep trying to finish editing three of my own short films which are sitting on my editing computer, staring at me and saying "edit us!" but it's sometimes tricky to find the time! 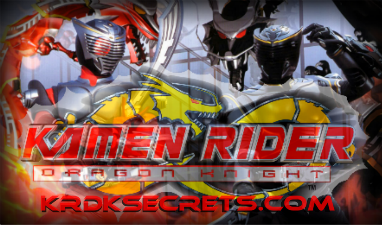 What do you think of the fan community for Kamen Rider Dragon Knight? The Kamen Rider fan community is great, and it's beautiful to see an excited, enthusiastic fan base for a show. As soon as the show went on the air I was asked to do a live chat with some fans, along with the head-writer and some members of the cast - and I was blown away by how much the fans on this chat all loved the show, and how much they're into it. One of my favorite moments was when I was at Toys R Us in Times Square in New York once, I had gone in to the store to look at the action figure shelf when the KRDK action figures had just come out, and there was a guy there looking at them and picking one out, and he started talking to me abut the show, not even knowing I'd worked on it, said he records it every week. Made me happy. Plan on interviewing more cast and crew soon?